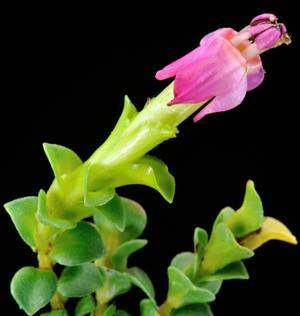 Saltera sarcocolla belongs to the Penaeaceae, which is a family confined to the fynbos region. Despite interesting variations in plant and flower size, groupings and colour, there is only one species in the genus Saltera. Saltera sarcocolla is a medium-sized, sturdy, upright shrub producing strong stems coppicing from a persistent, woody, underground root-stock. It has an open bushy habit growing up to 1.0-1.5 m in height, although smaller forms also occur. The leaves are broadly egg-shaped and distinctively arranged in closely ranked, alternately opposite pairs along the upper stems. The branches below the leafy parts are knotty from leaf scars. The leaves are leathery, grey-green and covered with a waxy bloom. The upper leaves merge into pale, sticky, relatively large yellowish-brown bracts or bract-like leaves, which enclose the cylindrical flowers that are presented at the ends of the branches. 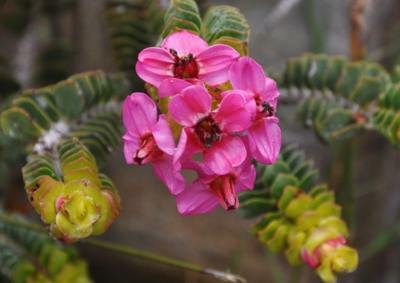 The bright, attractive colour is mainly provided by the four, reflexed, sticky, pink-mauve lobes at the end of each flower tube. There is conspicuous variation in Saltera. As a general rule those populations on the southern Cape Peninsula and closer to the coast at Hangklip, Betty's Bay, Hawston Danger Point and the Soetanysberg (Bredasdorp District) are smaller shrubs with single flowers. Transitional forms are found on the Cape Peninsula in Red Hill and Fish Hoek mountains and off the peninsula at Pringle East Peak. Larger, multi-flowered forms are found on the Muizenberg and Steenberg Mountains and north to Table Mountain, excepting above Camps Bay where they are unifloral. Off the peninsula large flowered forms are found on the Hottentots Holland Mountains from Sir Lowry's Pass to Rooi Els, Palmiet River Mountains, Houwhoek, Franschhoek, east to the Klein River Mountains and Villiersdorp to Genadendal. The flowers are normally aggregated into groups of four; however variation exits. The most notable exception is on the southern Cape Peninsula where the species becomes a smaller, depauperated form with single flowers. This smaller form is nevertheless very attractive. The main flowering time is from August to September. The flowers and bracts age to become crispy-brown sticky clumps at the ends of the branches. When opened these reveal four elongated, pointed capsules that split open when dry to reveal four chambers. The seeds are small, narrowly obovate (elongated and rounded at each end) and neatly tucked into each chamber. Each seed is complete with an aril at one end. Least Concern (LC). Saltera sarcocolla is not threatened. Saltera is found on the Cape Peninsula and the Western Cape along the coast as far as Cape Agulhas and extending inland to Franschhoek, Hottentots Holland Mountains, Villiersdorp and Genadendal. It is commonly found on sandy hills and mid- to upper mountain slopes in rocky habitats from sea level to 1000 m. Saltera is from the fynbos region and therefore adapted to a Mediterranean climate with cool, wet winters and warm, dry summers. The temperature range is probably between 5 and 35 °C and rainfall between 500 and 1500 mm per annum. It is unlikely to be frost tolerant. The genus Saltera was named in honour of Terence Macleane Salter, 1883-1969. Born in England, he was paymaster-captain in the Royal Navy, stationed at Simonstown. He retired in 1931, stayed in South Africa, and worked in the Bolus Herbarium until 1960. He was a prolific plant collector, an authority on Oxalis, co-editor of the Flora of the Cape Peninsula, and is commemorated in numerous plant names. Sarcocolla is from the Greek sarx, sarkos, meaning flesh, and kolla, glue, referring to the stem just below the inflorescence, which is fleshy and sticky. The name Sarcocolla was first given as the genus name by Linnaeus in 1735 but then he changed his mind and called the genus Penaea in 1753. The name was used by Boehmer in 1760, and by Kunth in 1830. Kunth's definition was in use by botanists, whereas Boehmer's definition had been overlooked and was not in use. In 1915, three species of Sarcocolla were recognised: S. minor, S. squamosa and S. tetragona. In 1940, based on his field observations where he could find no definite character to warrant its separation even into varieties, Salter recommended that the three species be amalgamated into one under the oldest name, S. tetragona. However, in 1958, when it was realised that the generic name in general use was the later and thus incorrect one, according to the international rules of botanical nomenclature, Bullock decided to coin a new name for the genus, calling it Saltera, in recognition of Captain Salter "who has done so much by example and precept to stress the importance of the study of living plants in the field in order to arrive at an understanding of their taxonomy". He thus named the genus Saltera with a single species S. sarcocolla. Saltera sarcocolla grows in sandy, rocky areas, often in rock fissures on shelving rather than steep slopes. It is mainly concentrated towards the coast, but is also found as far inland as Genadendal and Franschhoek. It is pollinated by sunbirds. Nectar is secreted at the base of the ovary, and the pollen sacs rupture when touched and shed their pollen in a little cloud. The sticky secretion of the bracts may also attract the birds, but is probably more useful as protection from certain insects, which get stuck in it, also the source of its Afrikaans name, vlieëbos, literally meaning 'flies bush'. The flowers aggregated in the flower head become brown with age, but remain very sticky. These are often blown off and fall to the ground where strong summer winds shift them around. When the capsules dry they split, releasing the seed, which either drop to the ground or stick to the dead flowers. Seeds may be distributed in this way. Each seed has an aril, which is an edible enticement, encouraging transport by animals and thereby assisting in seed dispersal. It is probable, but not personally observed, that ants disperse the seeds for Saltera, taking them into the protection of underground burrows. Seeds germinate after fire and are slow growing and have time in the course of their development to produce an underground root-stock. The time needed to develop a rootstock probably differs from species to species and depends on the conditions the plant experiences, i.e. environmental stress such as drought or after the first fire event. In Saltera it takes about five years before any evidence of rootstock is noticed in cultivation. Mature plants with a root stock are very long-lasting as they coppice vigorously after each fire event. New branches emerge in great numbers from the base of the stem (root stock), giving the shrub a rather different habit from the sparse tangled branching in older specimens. There is a gum-resin, called sarcocolla, that was used in the days of ancient Greece and Rome, both medicinally and to make ink or paint. The gum-resin sarcocolla reputedly came from a tree also called sarcocolla and was imported from India, Turkey and Persia. It was supposed that the source of this gum was Penaea sarcocolla (as Saltera sarcocolla was first known) or P. mucronata , but this is not correct. The true source is Astragalus sarcocolla , a legume from south-west Asia. Saltera sarcocolla is not used in traditional medicine in South Africa. Saltera sarcocolla is not in use in horticulture, but is grown for fynbos garden beds at Kirstenbosch. It is easy to cultivate from seed and from cuttings, provided the cutting material is specifically selected from the plants at the right stage after fire. Saltera is easily grown from seed, which should be sown in late summer, autumn or spring. Germination is greatly enhanced by the application of smoke, which mimics the positive effects of fire on fynbos in nature. Seed is sewn onto well-drained, acidic growing medium consisting of a combination of river sand and well decomposed pine bark in roughly equal proportions. Seed germinates in about six weeks, emerging as small plantlets that must be lightly watered with a watering can. Let the seedlings grow to about 10 mm tall before planting them into small individual pots. Young seedlings are encouraged to grow by feeding weekly with a diluted organic fertilizer. Seedlings grow slowly and will only be big enough after at least twenty-four months, at which stage they may be planted into the garden. It is advisable to plant out during the cooler autumn or early winter months to allow the plants to become established before the onset of summer. Saltera may be rooted from cuttings in autumn or spring, and even other times of the year. They are rooted in multi-trays on heated benches under mist spray. Experience has shown that the only way to make root cuttings of this species is by taking heel cuttings off the underground rootstock. This means there must be access to mature plants with a substantial rootstock, which invariably means plants growing in natural areas. Collection of these cuttings may only be done with a valid permit from the relevant authority, i.e. Nature Conservation or SANPARKS. Cuttings have to be taken after a fire event, which encourages vigorous re-sprouting of fresh new material. The young, slightly hardened, new shoot is held at ground level as close to the root stock as possible and pulled so that it comes away with a heel off the root stock. The base of the heel cutting is treated with a rooting hormone for semi-hardwood cuttings, and is then placed into a rooting medium of 50:50 fine-milled bark and polystyrene or perlite pellets. Rooting rate is normally very good, being over 80%. Saltera has not been grown extensively, and experience may be limited to Kirstenbosch Garden. Plants grow readily in pots where they are enduring. Plants placed in a garden situation have survived, but losses are experienced. Kirstenbosch is still experimenting with the best cultivation methods. It must be grown in acidic, well drained soils and appears to prefer growing in rockeries with as little disturbance as possible to the soil around it. Good watering once a week during the summer months, in winter rainfall areas, is recommended for the first year. Saltera can be grown in a medium-sized container, as long as the correct, well-draining growing medium is provided. Fynbos planting medium is made up of a combination of equal parts composted pine bark or pine needles and river sand. 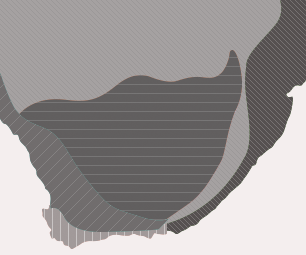 A little (20%) loam may also be added. It is a woody species, so regular pruning is recommended to keep the plants well branched and compact. Plants that are pruned are more presentable, last longer, and produce more flowers. Regular pruning of Saltera will encourage the development of the underground rootstock. Saltera is adapted to living in poor soils, but for best results it should be regularly fed with diluted organic liquid or small amounts of organic pellet fertilizers that are low in phosphorus. It should be planted in amongst rocks or in rockeries on sloping ground. Plant companion plants closely around it to provide the natural protection of nurse plants as happens in nature. Some recommended companion plant groups include ericas, buchu, small restios, and the smaller members of the Protea family. Jackson, W.P.U. 1990. Origins and meanings of names of South African plant genera . University of Cape Town Printing Dept., Cape Town. Bullock, A.A. 1958. Nomenclatural Notes vii. Kew Bulletin 109-110. The Eponym Dictionary of Southern African Plants: http://www.calflora.net/southafrica/1P-S.html accessed 7 October 2013. Dahlgren, R. 1968. Studies on Penaeaceae part II. The genera Brachysiphon, Sonderothamnos and Saltera . Opera Botanica 18 : 5-72. Greek and Roman Methods of Painting, no author or date found, digitised by Google, accessed 7 October 2013: http://books.google.co.za/books?id=YGE0AAAAIAAJ&pg=PA26&dq=sarcocolla&hl=en&sa=X&ei=dMBSUqunI-OI7Ab9wIHgDg&ved=0CEUQ6AEwBA#v=onepage&q=sarcocolla&f=false. Lev, E. & Amar, Z. 2008. Practical materia medica of the medieval eastern Mediterranean according to the Cairo Genizah . Sir Henry Wellcome Asian Series, Brill. Leiden, The Netherlands. Thomson, T.. 1838. Chemistry of organic bodies. Vegetables. London: J.B. Bailliere.